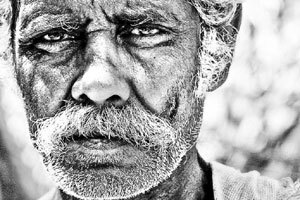 Karthick is a young photographer who specializes in portrait photography. Karthick, basically from Thanjavur, is a software professional working in Impiger Technologies with an intuit passion for photography and love for nature. He presents a collection of his portraits of elderly people where every line reveals a hidden emotion. Karthick’s creations are based on the ordinary, the mundane, the everyday life, capturing that one singular moment that could indeed change the way we see things, - things that we simply ignore and move on.